Enjoying the damp, dark quiet of an unremarkable night, I’m walking alone on the sidewalk. It seems to move beneath my feet like a giant treadmill and I find myself feeling, although mobile, quite stationary. Lighted by street lamps and porch lights, the path ahead is clearly defined, empty, and normal; but somehow it seems as if my steps are being delivered at the sounding of my souls. I imagine, briefly, the satisfying thud calling forth the next foot of Earth. Buildings drag by and cracks slip away – each sight eventually erased by a few swift steps and a blurry peripheral view. I picture the great gears associated with turning the ground and wonder how the track will be replaced after years of shoes like mine tear and fray it to shreds. I know this straight path will take me far enough to reach my house, but I wonder, then, how much farther I would have to walk until it looped around. How long, exactly, have I been doing homework? I shake the imaginary treadmill from my consciousness and attribute its conception to the materials in my backpack. A drained laptop, a pair of worn notebooks, a scratched calculator, and a single dulled pencil; all remnants of an evening spent preparing for exams. And now, as evening has turned to night, I’m drained. I realize that I’ve studied myself into a mild state of senselessness and now I’m paying for it with lucid visions of insanity. I hold the conclusion for a moment, pitting the worth of grades against that of sanity. Not just for myself, but for everyone. From the particularly studios inhabitants of the library (in other words, not me) to the drunk porch inhabitants adding spark and zest to my walk. Grades are certainly important – I know – but there’s a balance to be found. Because you can’t allow imagination – what I suddenly realized I had called senselessness – to become foreign. Otherwise it’s all down hill from here. This is a very dense, moist and chocolaty cake. It’s my go-to, and it never EVER lets me down. The recipe below will make two 6-inch layers. Doubling it will produce, two 9″ layers. Preheat oven to 350F (175C). Oil and line either two 6-inch pans. Set aside. Cream the butter and sugar, until very light and fluffy, about 5 minutes. Add the eggs, one at a time, beating until very well incorporated. Add the vanilla. 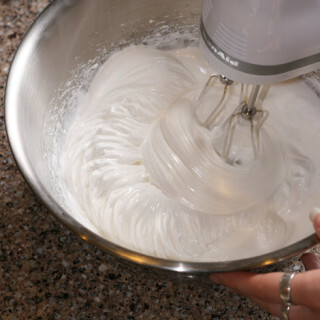 Being sure to scrape the bowl often, pour in a third of the dry ingredients, mix until just combined, then add half of the sour cream and mix until just combined. Repeat, then add the remaining dry ingredients. Gently stir in the hot coffee, and pour into prepared pans. Bake 35 to 40 minutes. Place baked cakes in pans on a cooling rack for ten minutes, then remove the cakes from the pans and allow to cool completely before continuing. it’s ok. Once all the butter has been added, return the speed to high and keep whipping until the frosting comes together. Add the vanilla and beat until incorporated. Chill the cakes for at least two hours, then split them. Fill with Italian Meringue Buttercream and crumb coat. Frost and serve at room temp. 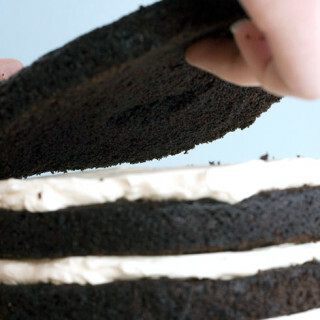 How to stack and crumb coat. 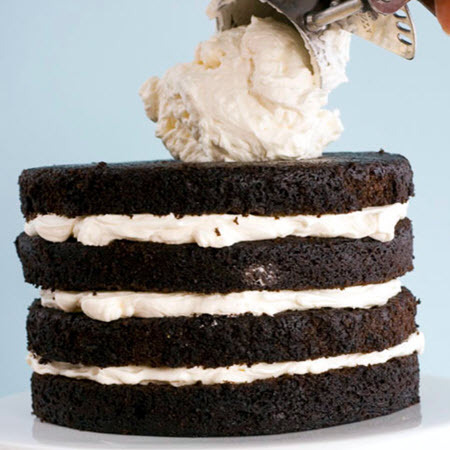 How to frost a cake. 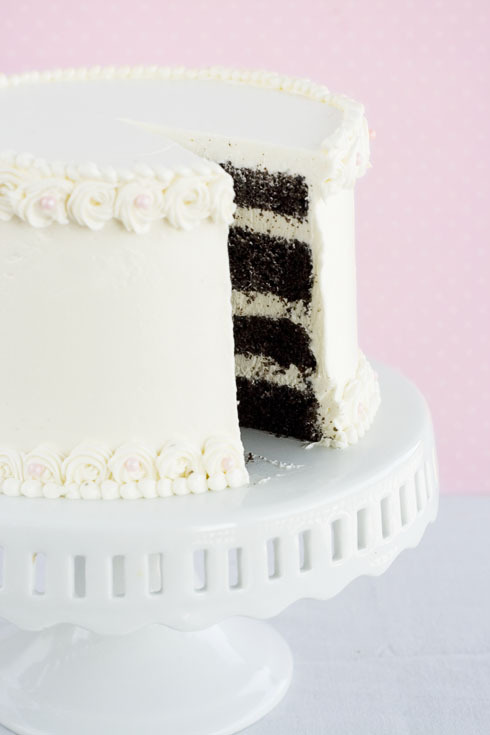 I will dream of this cake…<br />It&#39;s GORGEOUS!! WOW! This cake looks so stunning. Love the contrast of black and white, beautiful! That lloks so good. you do a great job frosting. 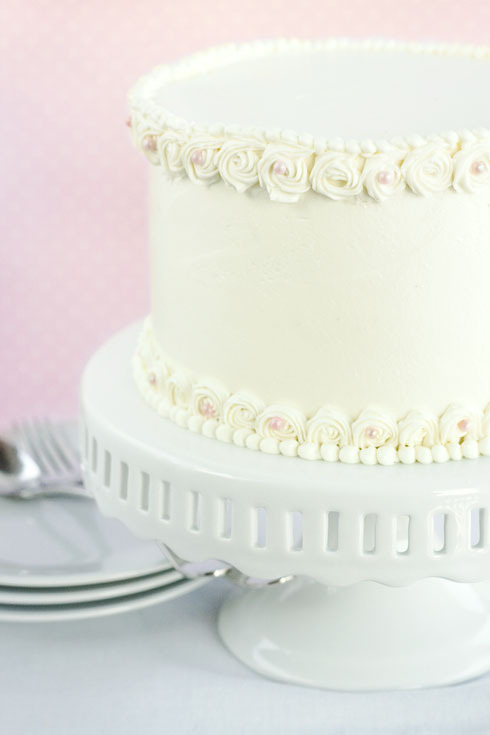 What a lovely cake (and cakestand)! 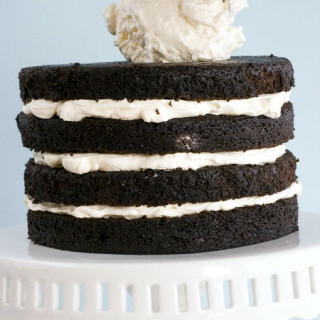 that cake is very oreo looking and it sounds good… i may try this frosting out for my kids birthday… do you think little kids would like this frosting? it sounds amazing. This is just simply stunning! This cake looks amazing. Try as I might, I cannot ice a cake with totally smooth sides like yours. 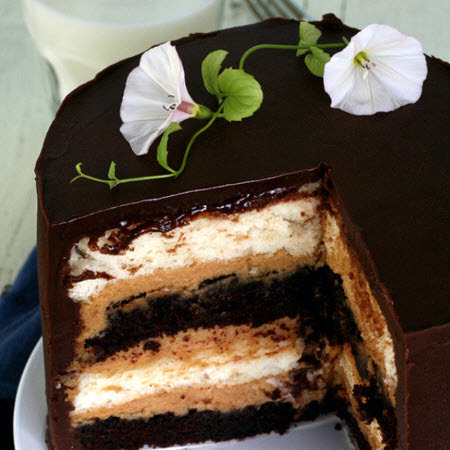 Your layers are so level and your filling is perfectly level as well. What am I doing wrong? Ahhhh!!!! Beautiful cake. I will have to try the choc cake recipe. Even though many folks thing choc cake is choc cake..they are all a bit different. Yours looks like a nice deep chocolate. We finally get to see the finished product in all its glory! Beautiful. I loved this 3 part tutorial so thank you! Wow, that looks amazing! I&#39;d love to eat a slice right now. Lovely cake! 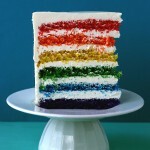 I love layers upon layers of cake!!! I will have to give this a try! Thanks for sharing! WOW gorgeous cake! I love baking cakes yes I do! Frosting them as well! It&#39;s lot of fun. Especially when my daughter is around to help. She&#39;s very good at this kind of stuff. 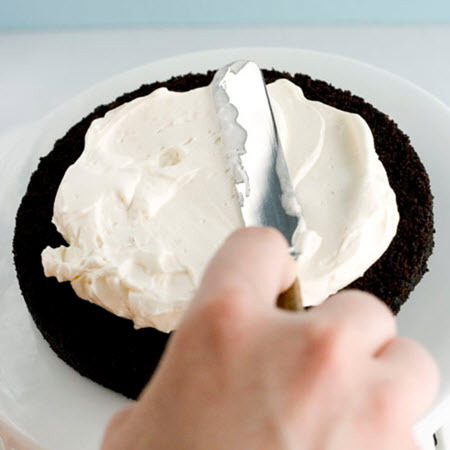 I made mine with a Bailey&#39;s Irish Cream buttercream and this is the most delicious chocolate cake ever! So moist and that hint of coffee really went with the Bailey&#39;s! Kaitlyn I doubt I&#39;ll ever have the presentation skills you do, but all of your recipes are foolproof and tasty! 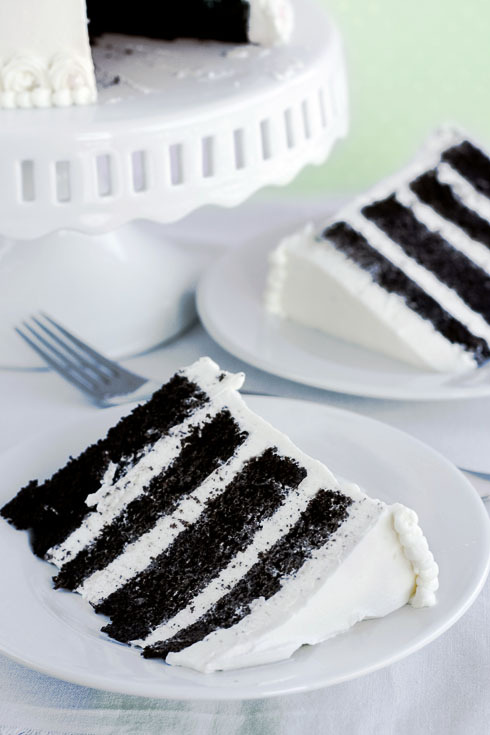 I love the contrast of the black and white, you always make the most beautiful cakes! I just found your blog through tastespotting! It is absolutely amazing! I have a feeling that I&#39;m going to be checking back here often. This looks like perfection! 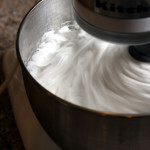 I&#39;ve made your swiss meringue buttercream, I guess it&#39;s time to give the Italian a shot. I love that your cakes are always ridiculously tall. I always say a single layer cake is just lazy; two layer cake a perfect afternoon snack, three layers for the weekend, four for weddings, five for birthdays. 😉 I&#39;m addicted to cake. Dear god this looks amazing…..I love how tall it is, and the beautiful piped roses along the top. 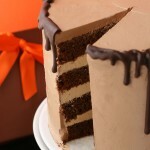 Not to mention the chocolate cake looks mouth wateringly delicious!! I made your italian butter cream over the weekend and it was awesome! My new favorite frosting! Quick question though – this recipe calls for 1/4 cup of water, but the longer tutorial says 1/2 cup water… does it matter? Simply stunning. I love the roses! Came over from Kat&#39;s blog. Wonderful photography of your baked goods and the recipe looks awesome. Wish I enjoyed baking like that. Of course if I did I would weigh 300 pounds, too. You are a force to be reckoned with… I like how you think! Beautiful cake. Yum. from the look of your pictures, i can tell why this is your go-to recipe! i was looking at a similar recipe and im now in a dilemma. heck, i might just make both recipes! now the question is, how soon? I just found your blog and I&#39;m already in love with you. Thank you for making me drool profusely on my keyboard. I just made this cake for my youngest daughter&#39;s 19th birthday, and it was wonderful. Thank you for a perfect birthday cake! Sounds lovely! And smells good, too! The chocolate cake just came out of the oven. It fell a little on the cooling rack. Can that be avoided? (Not that it really matters as it will be covered in buttercream but still…)<br />Now on to the buttercream challenge! Thanks for your comments, everyone &lt;3<br /><br />Colleen and Johanna – I&#39;m happy to hear you liked it! Johanna, I&#39;m not sure why the cake sank 🙁 Sorry! Question – Is there a reason you wrote 4/6 cup instead of 2/3? Nope! I&#39;m not sure at all why I did that. Thanks for pointing it out – consider it revised! I&#39;ve made this cake twice and it&#39;s so yummy! The first time I used it to make ice cream cake and it was PERFECT! I layered vanilla ice cream and frosted with French vanilla cool whip!<br />today I made it with the frosting. I need to work on my buttercream but it was good!<br />mine doesn&#39;t come out as dark as yours …but it tastes good! So glad to hear that, Jen! Love your blog…your tutorial on IMBC and SMBC got me through successfully the first time! 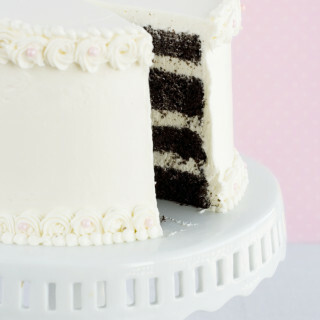 Do you know how this cake would hold up to carving and stacking under fondant? Thanks so much! Cake was great. Italian Buttercream was disaster. Going back to Swiss version which always works. Not a stupid question! I actually don&#39;t know what kind of difference it would make 🙁 Sorry! I have a question and I hate to bother you with it. Can you really taste the coffee in the cake? I want a really nice chocolate cake for a child&#39;s party, but I don&#39;t think coffee would go over well. So I am finally getting around to using this recipe. Instead of regular coffee I used Chocolate Raspberry Truffle coffee. It smells incredible. Getting ready to start the butter cream. I will let you know how it turns out. From the smell of it I am going to say AWESOME! What a lovely cake…:P My Kids like this cake very much. Thanks buddy..These are <a href="http://www.merirasoi.com/recipe-categories/kids-recipe.aspx&quot; rel="nofollow">kids friendly recipes</a>. Hi…I made this cake today and it turned out great. Just a couple question – the weight of the flour seemed off on my scale. Is it 1 and 1/3 cups total? That was over 200 grams. Also, what brand of cocoa and brown sugar do you use? My cake tasted delicious but it wasn&#39;t nice and dark like yours. Thanks for the great recipe! Should one use cake flour or all-purpose? Made this for my step mom&#39;s birthday and everyone agreed it was the best cake they&#39;d ever had. Btter, deep, rich, not too sticky sweet… I&#39;m allergic to chocolate so I took their word for it on the cake, but I loved the frosting! This is still my favourite cake in the world. I’m so glad you’re posting again! I particularly love that you do everything from scratch – I live in South Africa, so a LOT of the pre-prepared ingredients available in the States just don’t exist here. Plus, everything tastes better home-made. 😉 Thank you for all the recipe love that you give us! You’re so sweet! Thank you! And I’m glad you appreciate the from scratch aspects too. I agree it tastes better – and it’s so much more fun that way too! I have used your recipes for the last few years, and find the tutorials so easy to use! I would like to make the chocolate cake, but my daughter wants a Barbie doll cake, so I plan to use a bundt pan. I am wondering about the cooking time. Do you know how I should adjust the cooking time to ensure the cake cooks correctly in the bundt pan? Also, for a 3 layer cake, do you think I will need to double the recipe? Thank you! Aw, thank you Stephanie! I am happy to hear that you’ve enjoyed the recipes!